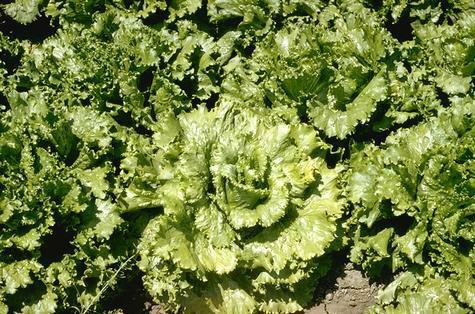 The potyvirus Lettuce Mosaic Virus (LMV) is a major pathogen of commercial crops in lettuce-growing areas world-wide and can result in severe crop losses in the field (Dinant and Lot, 1992). In the absence of control measures, LMV is the most detrimental virus to lettuce crops (Davies et al., 1997; Blancard et al., 2003; Le Gall, 2003). Symptoms of LMV vary depending on the lettuce variety infected and the age at which infection occurs. Leaves of young infected plants can be stunted, deformed or mottled with chlorotic lesions and rarely attain full size. Heads fail to form when young plants are infected. Plants that are older upon infection may reach full size but will have deformed, yellow outer (older) leaves. The wrapper leaves on head lettuce varieties infected at an advanced stage of development may exhibit brown, necrotic flecks and often curve away from the head; any heads still developing on these plants may be deformed. LMV is vectored by aphids and many isolates are also transmitted through seed (Krause-Sakate et al., 2002; German-Retana et al., 2008). Planting seed tested for LMV and thereby certified to be free of infection is the primary management tool. Since the virus can infect numerous crops and weeds thereby creating reservoirs of the virus that can be vectored into a crop, weed control and aphid management are also important. Resistant lettuce varieties also exist (see below). Reliable tests for evaluating LMV resistance of in vitro-cultivated lettuce plantlets 2-3 weeks after inoculation are also available (Mazier et al., 2004). Three dominant genes that confer resistance to LMV, Mo2, Mo3, and Mo4, have been identified (reviewed in Candresse et al., 2006). Mo2, from L. sativa cv. Ithaca, is readily overcome by many LMV isolates. Mo3 and Mo4, derived from L. virosa sources, are difficult to introgress and not well-characterized. These dominant genes have not currently been used in the field. A fourth gene, mo1, has proven to be highly effective against most but not all isolates of LMV (Dinant and Lot, 1992; Blancard et al., 2003). This gene is recessive. Two alleles of mo1 have been identified: mo11 was originally identified in the cultivar 'Gallega de Invierno' (Bannerot et al., 1969), and mo12 in primitive lines of Lactuca sativa (Ryder, 1970). These alleles confer complete resistance or tolerance to LMV depending on the genetic background into which they are introgressed and the viral isolate attempting infection (Dinant and Lot, 1992; Bos et al. 1994). The mo1 gene has been introgressed into both crisphead and romaine lettuce types; L. sativa crisphead cvs. Salinas 88 and Vanguard 75 contain mo12, are LMV resistant and nearly isogenic with cvs. Salinas and Vanguard, respectively (Ryder, 1979; Ryder, 1991). The mo1 gene has been cloned (Nicaise et al., 2003). It encodes the eukaryotic translation initiation factor 4E (eIF4E). At least one copy of the wild-type eIF4E gene is required for virus accumulation in lettuce (German-Retana et al., 2008). The resistant alleles of the eIF4E gene in lettuce, mo11 and mo12, are currently the only genetic determinants used to protect lettuce crops from LMV. We used the DNA sequence differences in the eIF4E alleles of lettuce cultivars that are resistant to LMV and those that are susceptible (Nicaise et al., 2003) to develop genetic markers to aide in introgressing the mo12 allele into elite lettuce lines. We exploited the single nucleotide difference (a 'G' nucleotide in wild-type eIF4E and a 'C' in mo12) which changes an alanine amino acid residue at position 70 in the eIF4E protein into a proline residue, to develop two methods of detecting the mo12 allele for resistance in lettuce. One method utilizes agarose gels to score the genetic marker. The other method utilizes the Illumina GoldenGate SNP assay. The DNA Technologies Core Facility at UC Davis Genome Center has Illumina Beadstation and BeadXpress systems (Illumina, San Diego, CA) that can be used for analyzing these markers. Blancard D, Lot H, Maisonneuve B (2003) Maladies des salads: identifier, connaitre, maitriser. INRA Editions, Paris, 375p. Davies RM, Subbarao KV, Raid RN, Kurtz EA (1997) Compendium of Lettuce Diseases. APS Press, St. Paul, 79p. Le Gall O (2003) Lettuce mosaic virus. �CMI/AAB Description of Plant Viruses� no399. Edited by AT Jones, DJ Robinson, N Boonham and R Mumford. Wellesbourne, UK: Assoc Appl Biol. Ryder EJ (1970) Inheritance of resistance to common lettuce mosaic. J Am Soc Hort Sci 95:378-379.